The years 1251-1302 were a sort of golden age for the monastery of St Mary's at Helfta, Germany. Originally founded by the Cistercians, it followed the Cistercian constitutions but did not belong to the order. In fact their spiritual directors were Dominicans. Under the holy and learned abbess, Gertrude (not to be confused with St Gertrude), Helfta became a center for culture as well as a school of spirituality. Three of the Church's greatest mystics lived at Helfta in the years 1251-1302 - Gertrude the Great, St Mechtild and Mechtild of Magdeburg. Gertrude entered the famous monastery school at Helfta, at the age of 5. Unlike her companions she did not belong to the nobility. She may have been an orphan. From a very young age she gave evidence of her brilliance and quickly outstripped her companions. Her love for secular studies made the common life wearisome, pride and vanity ate away at her soul and she soon became an unhappy young woman until Christ appeared to her. The day was branded in her memory, it was in her 26th year, when as she says "in a happy hour, at the beginning of twilight, thou O God of truth, more radiant than any light, yet deeper than any secret thing, determined to dissolve the obscurity of my darkness." From then on her biographer tells us "she became a theologian instead of a grammarian." She did not give up her intellectual ardor but now, all her labors were for her sisters, to cure what she termed "the wound of ignorance". Her many gifts and mystical graces did not prevent her from giving herself wholeheartedly to the common life with its joys and sorrows. In fact many of her special graces came to her as she took part in the ordinary routine of convent life. She felt keenly for those whose burdens involved them in distracting duties, for example those responsible for meeting the debts of the monastery. Well she prayed that they might have more time to pray and fewer distractions. The Lord's answered "It does not matter to me whether you perform spiritual exercises or manual labor, provided only that your will is directed to me with a right intention. If I took pleasure only in your spiritual exercises, I should certainly have reformed human nature after Adam's fall so that it would not need food, clothing or the other things that man must find or make with such effort." Gertrude is inseparably associated with the devotion to the Sacred Heart. The pierced heart of Jesus embodied for her the Divine Love, an inexhaustible fountain of redemptive life. Her visions and insights in connection with the Heart of Jesus are very enlightening. In one such intellectual vision, she perceived the unceasing love of Christ for us in two pulsations of his Heart - one accomplished the conversion of sinners, the other the sanctification of the just. Just as our own faithful heart keeps right on whether we advert to it or not, these pulsations will endure till the end of time despite the vicissitudes of history. In many of the visions of the Sacred Heart, we find St John the Beloved Disciple present. He who leaned back against Jesus' chest at the Last Supper. On his own feast day, St John appeared and placed Gertrude near the wounded side of the Savior, where she could heart the pulsations of the Sacred Heart. "Why is it, O beloved of God", she asked him, "that you who rested on his bosom at the Last Supper have said nothing of what you experienced then? St John told her "It was my task to present to the first age of the Church the doctrine of the Word made flesh which no human intellect can ever fully comprehend. The eloquence of that sweet beating of His Heart is reserved for the last age in order that the world grown cold and torpid may be set on fire with the love of God." I found this strangely moving. Is it because I secretly mourn the demise of so many true and instructive devotions which sustained an earlier time. Or perhaps I repent my being appalled by those dolorous pictures of Christ which graced the Friday Holy Hour booklets, when I accompanied my grandmother to those devotions as a young lad. Our age seems taken up with spirituality and yet for the most part, it seems to have invested God with a benign impersonality - Divine Energy, Ocean of Bliss etc. Non-threatening it is true but also not terribly concerned with our welfare as well. The idea of God as Person having absolute rights over our own persons seems constricting and suffocating. We have these two poles so wonderfully addressed in Jesus. We have the Divine person and yet he never overwhelms us. For as true man he is so very close to us. What struck me when reading about the visions of St Gertrude is the truly intensely personal nature of the relationship. The Lord is almost embarrassingly concerned with every little aspect of Gertrude's life - personal and communal. Any yet He remains the Lord of wide swathes of history. This is the great wonder of the Incarnate Lord - Lord of all and yet loving each one through the individuality of his own human nature with so particular and intense a love as if he or she were the only soul on this earth. 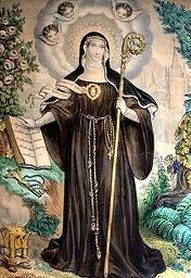 St Gertrude in her devotion to the Sacred Heart reminds us that His sacred humanity is so wonderfully united to the Person of the Word that there are no barriers in it to the stream of life of the Godhead, which stream we drink from when we are united to Christ's sacred humanity. By Fr. Gerard D'souza of Abbey of the Genesee.